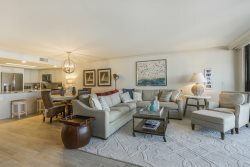 Completely renovated top to bottom Fall of 2018 featuring a luxurious coastal theme. This vacation rental features a clean and classic kitchen outfitted with granite countertops and full-size stainless steal appliances. The master ensuite bathroom has been upgraded with double sinks, walk in shower, and a walk in closet. While the guest bedroom offers a private balcony overlooking the water. Enjoy nightly sunsets overlooking San Carlos Bay at the Gulf of Mexico. This 2 bedroom / 2 bathroom condo is located in the charming community of Punta Rassa nestled at the base of the Sanibel Causeway. You may have found this rental on HomeAway 4834801, HA ID 4834801, VRBO 4834801ha or Vacation Rentals 4834801. Punta Rassa Condominium community is located at the gateway to Sanibel Island and Fort Myers Beach with spectacular view of the Sanibel Island Lighthouse and causeway is our beautiful community of Punta Rassa condos.